Here you will find a wide variety of needles for counted cross stitch, hand embroidery, beading, sewing and needlework. 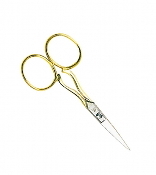 Just in DMC Embroidery Scissors perfect for embroidery, creative stitchery, sewing, scrapbooking and crafting. Dritz Size 18/22 Tapestry Needles 56T-1822 6 per package Tapestry Size 18/22 6 pc - 2 each of Size 18, 20, and 22. Tapestry needles have a characteristic blunt point and large eye. The blunt tip ensures easy stitching, as the needle can pass... Mill Hill Beading Needles for Needlework Projects - 40220, 2 needles per package Designed by Mill Hill these needles are exactly what you need to attach all of your Mill Hill Glass beads to your favorite needlework, cross stitch, embroidery, quilting and sewing projects. Two needles per package. Dritz Size 1/5 Embroidery Needles - 12 per package. Embroidery needles have a sharp point which makes them perfect for piercing tightly woven fabrics. They also have long eyes that allow for easy threading of multiple strands of thread. Great for embroidery, smocking, cutwork and creative stitchery. Dritz Size 16 Tapestry Needles - 5 per package. Tapestry needles have a blunt point and can slip easily through the holes of needlepoint canvas. Can be used for needlepoint and for stitching knitted items. Recommended for Tapestry wool. Dritz Size 3/9 Embroidery Needles - 16 per package. Embroidery needles have a sharp point which makes them perfect for piercing tightly woven fabrics. They also have long eyes that allow for easy threading of multiple strands of thread. Great for embroidery, smocking, cutwork and creative stitchery. Dritz Size 7 Embroidery Needles - 16 per package. Embroidery needles have a sharp point which makes them perfect for piercing tightly woven fabrics. They also have long eyes that allow for easy threading of multiple strands of thread. Great for embroidery, smocking, cutwork and creative stitchery.